Thera are the solemn names of emperors, generals, inventors of instruments of death, tortures and martyrs; and alongside them this one brihgt sound: Pushkin. 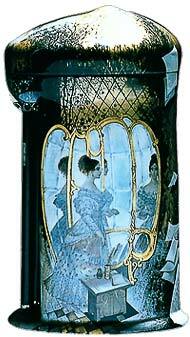 All these gems of art and insight remain as a landmark for Pushkin's successors, for the writers of later days. 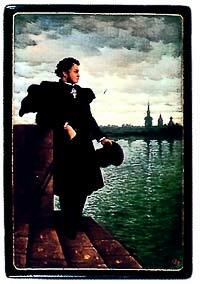 It is not too much to say that without Pushkin the gifted authors who succeeded him would never have transpired. At best, despite all their gifts of expression, they would have lacked the power and clarity from him derived. Without him we should have lost, not literature alone, but much of our irresistible force, our faith in our national individuality, our belief in the people's powers, and most of all our belief in our destiny. "Our children's voices in the noisy school were heard..."
"Once I wandered through the valley wild." These verses, with their sad, ecstatic music are the key to the first pages of a mystical book, written in prose by an old Englishman and sectarian. These lines aren't solely a key, for they embody the very soul of Northern Protestantism, of British doctrinal controversy, and the slow-witted, dour mystic, with his spiritual dreams and their impulsive power, and his determined but unbounded aspirations. You hear in the sound of these verses the very spirit of the times, of the Reformation. They bring home the hostile fury of early Protestantism, and you understand why Thought was swept by the times, walked through their sectarian camps, sang their Psalms, wept with them in their religious ecstasies, and joined in their belief. Compare this religious mysticism with the religious verses from the Koran or "Imitations from the Koran", and do we not find a similarity to Mohammedanism in the very spirit of its naive grandeur of faith and its appalling power? We find also the ancient world; the "Egyptian Nights", where the gods of earth sit, who ruled over their people like gods, despising their aspirations and their genius. These gods, in isolation, exerted their power, until they were overcome by madness from their utter weariness of isolation and strove to drive it off by Diverting themselves with inordinate brutalities, the sensual fascination of creeping things, of a female spider devouring its male. 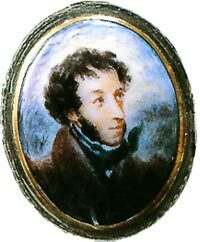 Emphatically I say, there never has been a poet like Pushkin, with his universal sympathy, his extraordinary profundity, and the miraculous reincarnation of his spirit in the spirit of other nations - miraculous, because the gift has never been repeated in any other poet in the world. This universality is only in Pushkin; therefore, I repeat, he is a phenomenon, a prophetic phenomenon, because he expressed in his poetry the national spirit - the national spirit in its future development, and the national spirit of our future, which, already, has come to pass. For there is no power in the spirit of Russian nationality, if not to aspire to universality, and an all-embracing humanitarianism. No sooner had Pushkin become a really national poet than he discovered the national power, and in anticipating the great future of that power, he was a true prophet, a real diviner.If he had lived longer, he might, through the power of his genius, have been able to immortalize the spirit of the Russian soul, bringing it closer and making it more comprehensible to our European family; perhaps succeeding in attracting them to us, more than they are now, and enabling them to see the truth of our hopes and desires - even giving them a better insight into our natures, that they might learn to regard us with less suspicion and with better understanding. Had Pushkin lived longer, or had we been able to fathom his great secret, we might find that among Russians, too, there would be less strife and less misunderstanding. But God willed it otherwise, and Pushkin, at the height of his career, died - and his great secret was lost to posterity. M.Pashinin"Pushkine on coast of Neva"
S.Kozlov. "Natalya Goncharova - the poet's wife"